36 cards, 5 variations of each. The total deck consists of 180 cards. Printed on premium 310gsm card stock with a luxurious linen finish. My new deck, the Build-Your-Own Lenormand is exactly what the name suggests. It is the first ever Lenormand deck that gives readers the opportunity to construct their own customized deck from 180 different cards. Five variations for each of the standard 36 Lenormand cards are available from which readers can hand-pick the ones they want in order to assemble a deck of their choice. For the first time on offer Lenormand readers can now purchase loose cards ranging from one single card to as many as they want or need. The BYO Lenormand offers so many potential combinations for readers to assemble a complete new deck, with or without additional alternatives, that there is almost no chance at all that any two buyers will end up with the same deck. The odds are better to win the Lotto twice in a row than to end up with the same deck as anyone else who assembles theirs from the BYO Lenormand. 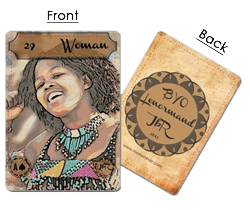 Because the BYO Lenormand deck is created in the same style as my Vintage Lenormand deck any of these 180 BYO cards can be added to the Vintage Lenormand deck without it looking as if they have been added on as an after-thought. They will seamlessly and perfectly blend in. This of course means that buyers can expand their existing Vintage Lenormand decks to include as many additional cards as they want, and they can hand-select these to their taste and liking or to reflect their reading style. With more and more new Lenormand decks becoming available deck creators are finding innovative and exciting approaches to attract the attention of potential buyers. 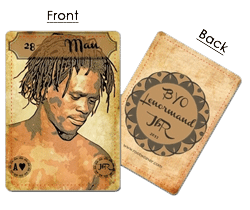 In an attempt to give Lenormand readers exactly what they want I tried to become more alert to their needs. Lenormand readers & collectors have become increasingly vocal about what they’d like to see in future decks, it was therefore only a matter of time before a deck creator heard them and started addressing these needs. Through attentive observation and with an ear close to the ground I soon realized that a BYO deck would address many of the requests and suggestions made by readers. This is how the idea to create a Build-Your-Own Lenormand deck developed. It is with pride and joy that I offer this unique first-of-a-kind deck to the Lenormand community. I invite my fellow deck creators to embrace this opportunity to give Lenormand readers more flexibility and control in the selection and assembly of their future decks, and I look forward to seeing other deck creators following suit with more options from which readers can choose. Carrie Paris for her unconditional love and encouragement, Lynne McGee for her unwavering faith in me and in the deck itself, Stella Waldvogel for her critically important evaluation of the deck before it was launched and for her encouragement and guidance, Marcus Katz and Tali Goodwin for their support and for the opportunity to launch the BYO Lenormand on the World Tarot Day platform. Ray Theron, Ryan Joffe, Stacey Elk, Elle Theron and numerous artists on Deviantart for permitting me to use and manipulate their sublime photography for this project, and last but not least my loving husband Gunther Graf who selflessly holds the energy of our lives together while I surrender myself to the creative flow. The BYO Lenormand can be purchased directly from my website at www.rootweaver.com where each of the 36 cards are listed as separate products, each with options A,B,C,D & E to choose from. Here’s hoping that this deck brings you at least as much enjoyment in its selection and use as what I have had creating it. And now (finally) I can breathe a sigh of relief because I don’t have to hold onto this ‘secret’ anymore, the cat is out of the bag. Thanks for ‘playing’ with me in the build-up and anticipation of this deck. Great idea!!!!! Very innovative & inspiring!!! A great result, from a wonderful, talented and innovative artist! Terrific idea! Hope it’s the tremendous success it deserves to be! Wow!!!! I’m blown over!! What an AMAZING idea!!! I’m so so pleased they are an extension of my already prized deck! Whoop! Whoop! Sounds amazing. Love the images you provided. They have a soft earthy feel to them and are warm. Hoping to see them in person some time! Very excited for you!! !